"I don't feel anything anyway." The Waterdance tells the intertwined stories of writer Joel Garcia (Eric Stoltz), ladies' man Raymond Hill (Wesley Snipes), and biker Bloss (William Forsythe). The three meet in a hospital ward for the paraplegic and severely disabled. As Joel works his way back to some level of functionality following a serious hiking accident, he finds himself unable to deal with his own anger, despite the assistance and support of his married girlfriend Anna (Helen Hunt). Neal Jimenez's script is structured as a series of vignettes. We are introduced to Joel as he is wheeled from the emergency room to rehabilitation, and introduced to his compatriots shortly thereafter. The story uses fadeouts to jump forward in time when it needs to, and we learn about Raymond's impending divorce, Bloss' loving but frustrated attachment to his mother (Grace Zabriskie), and the lives of the other patients on the ward. There's a quiet, natural rhythm to the movie—events happen very much as they would in real life. Sometimes one incident leads to another; sometimes a scene is just a moment of humor or pathos deserving of the filmmakers' attention. The casual flow of the script means that the actors aren't always given much to work with, and the leads do a good job of filling in the gaps, as well as the significant subtext that goes unsaid. Eric Stoltz turns in a credible performance as Joel, though he sometimes seems overly conscious of his character's disability, limiting his physical expression to the point that he seems emotionless. Wesley Snipes reminds us that he can indeed act, as a misogynist carouser who finds himself unbearably alone with his pain. William Forsythe is surprisingly sensitive as a careless, casually racist young man who matures almost in spite of himself, and Helen Hunt presages her later Academy Award®-winning work with a subtle, conflicted performance. There are times when the loose structure of The Waterdance requires some patience on the part of the viewer. Its emotional impact is built out of small gestures of friendship and intimacy, and its severely disabled characters aren't really free to pursue their "wants" in any visually dramatic way. The third act is slow in coming, and even then the action is more symbolic than cathartic; there isn't a lot that happens onscreen, but that's part of the point. It's a simple, gently paced observational drama about human dignity and spirit, subtly rewarding and uplifting without drifting into Patch Adams territory. Image Transfer Review: The Waterdance is presented in its original 1.85:1 widescreen theatrical aspect ratio, with a solid anamorphic transfer drawn from a clean source print (a few minor flecks aside). The film's fairly soft look and natural, muted colors are captured accurately by the digital transfer; there's a bit of edge enhancement, but the film looks as it should on DVD. Audio Transfer Review: Columbia TriStar's The Waterdance retains the film's original Dolby Surround audio track, encoded in Dolby Digital 2.0 format. It's a low-budget soundtrack, with dialogue that's occasionally a bit muddy; dialogue is centered, with music in stereo and just a few surround effects. Serviceable, but nothing fancy. Extras Review: The Waterdance on DVD is supported by 28 picture-menu chapters, subtitles in seven languages, and just a few standard extras. Selected filmographies (no biographical information) cover co-director writer Neal Jimenez, co-director Michael Steinberg, and stars Eric Stoltz, Helen Hunt and Wesley Snipes. The disc also includes trailers for The Waterdance and Birdy; both are presented in 1.33:1 open-matte format, with 2.0 monaural audio and a smeary, flickery video-mastered look. 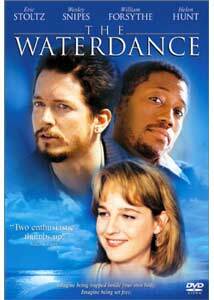 The Waterdance is a naturalistic, fairly entertaining look at several disabled men struggling to find their lives again. Columbia TriStar's DVD features a decent transfer, though supplements are limited. Worth checking out.